We are aware that license is an annoyance. But please understand us. PlanetCNC TNG software works only with Mk3 series of controllers: Mk3, Mk3/4 and Mk3ECO. 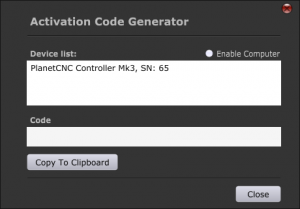 You cannot use PlanetCNC TNG software with Mk2,Mk2/4, and Mk1 controllers! You will notice that option “Enable computer” is available. With this feature enabled you are able to select your computer from Device list and generate activation code. We do not accept these activation codes. 4.) Select your controller from Device list so that becomes highlighted. Your license code will be sent to you via e-mail. Paste the license code that we sent you. You can use right mouse click and select “Paste” or you can use “Paste From Clipboard” button. 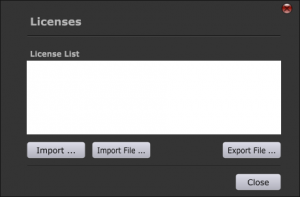 Software should notify you if license activation has been successful. You will also notice that green light at the bottom right corner is now without X. 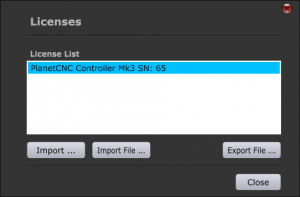 PLEASE NOTE: You cannot use old license with PlanetCNC TNG software as also setting files from old CNCUSB controller software.